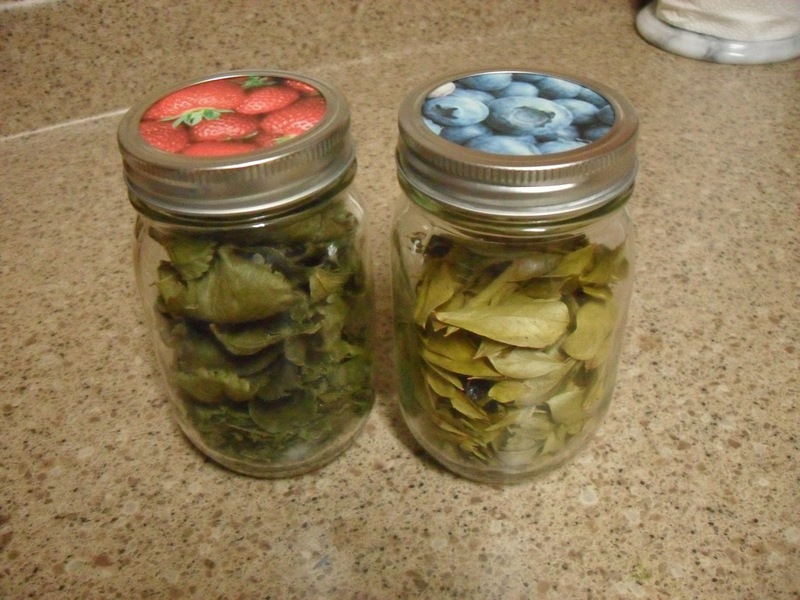 DIY Strawberry and Blueberry Leaf Teas! While many gardeners have been enjoying fresh, organic strawberries and blueberries from their own back yards this summer, most fail to realize that there is value not only in the fruit of the plant, but it the leaves as well. 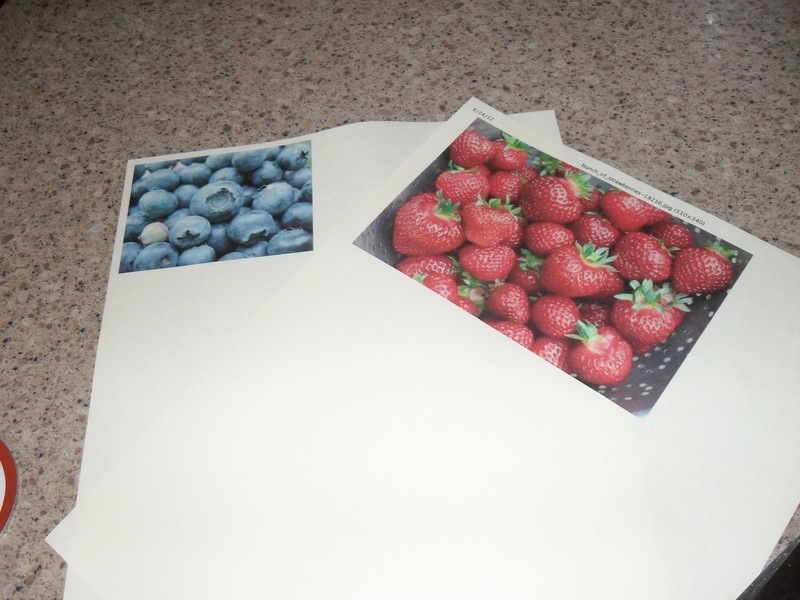 Blueberry leaf and strawberry leaf teas are sold in vitamin and health food stores nationwide. But why buy months-old tea bags when you can have fresh, organic loose leaf tea for free! 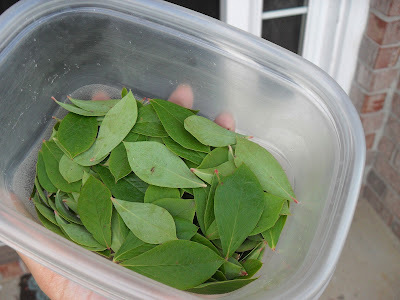 I'll show you how I harvested my leaves and dried them for later use. Be sure that you only do this if your plants are pesticide free. 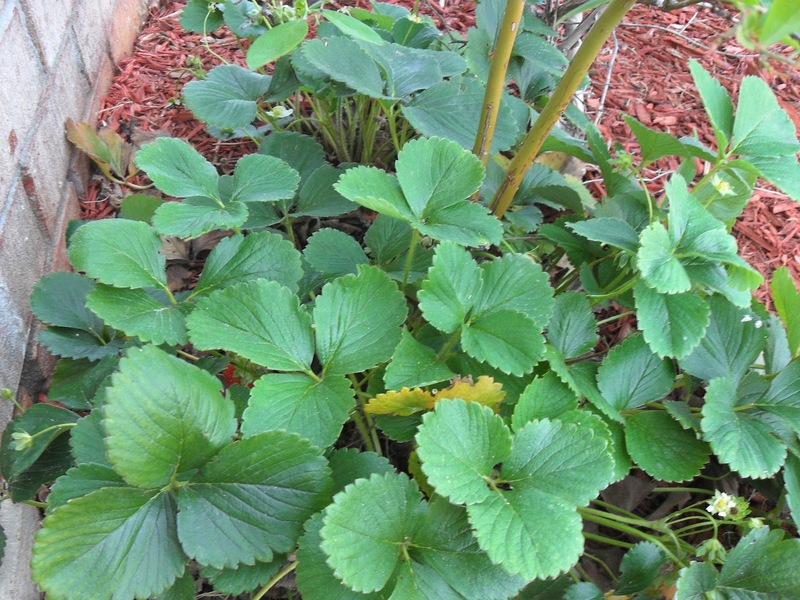 Here are our strawberry and blueberry plants. A little close, I know, but we didn't know any better! I started off with the strawberry leaves. In order to get the best flavor, you want to pick the smallest leaves you can find. Make sure that the leaves you pick have no yellowing, wilting, bugs, or bug bites. Only pick the leaves that are perfectly perfect! 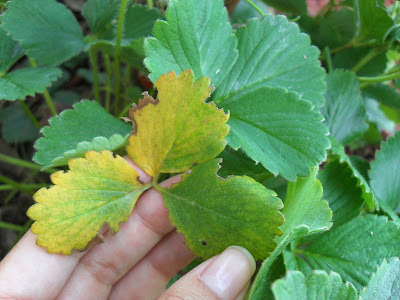 The leaves come in bunches of 3. Just pluck the stem, being careful not to pull up the roots. 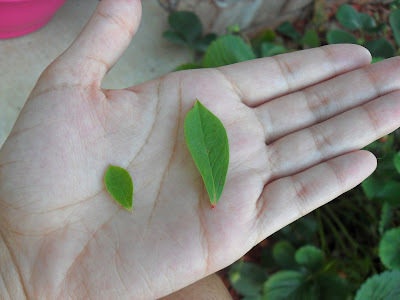 If one of the 3 leaves has a bite out of it, just pluck the whole thing and throw away the bad leaf. 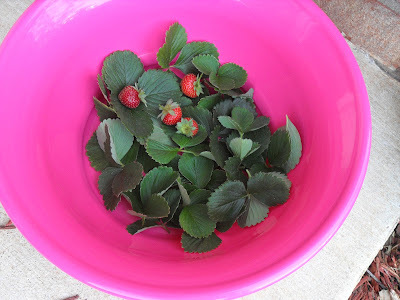 Keep picking until you have a nice big bowl of leaves (and maybe a few bonus berries :P). 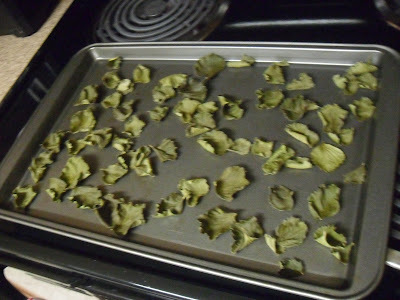 Keep in mind that the leaves will shrink during the drying process. The same rules apply when picking the blueberry leaves. The smaller, the better. No bugs and no yellow leaves. These leaves will take much longer to pick because they are much smaller. 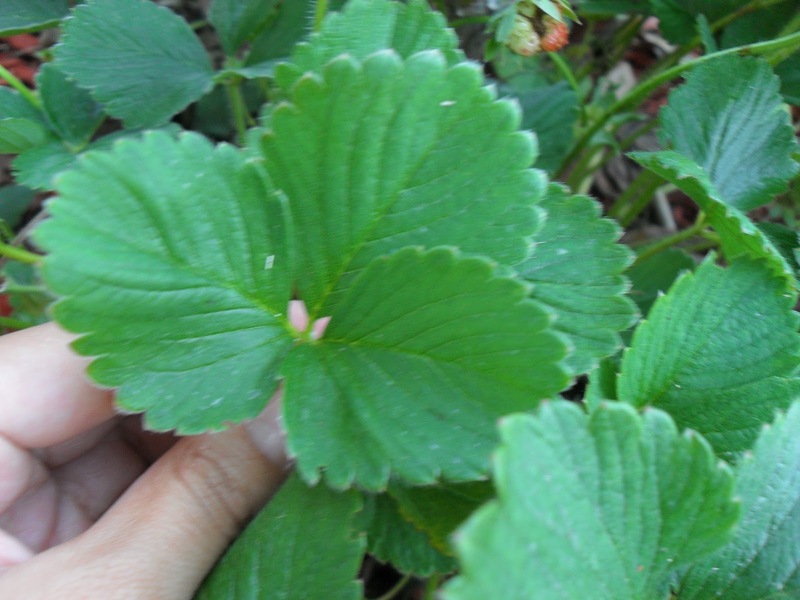 While most strawberry leaves are no smaller than a quarter and come in bunches of three, the blueberry leaves are picked one at a time, and you'll find leaves as small as your fingernail. These are the leaves you want to pick because they'll have the best flavor. 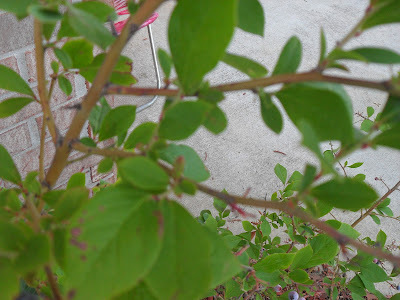 Start off by picking the teeny tiniest leaves you can until you're absolutely sick of picking all these tiny leaves and you're wondering why you're wasting your time. 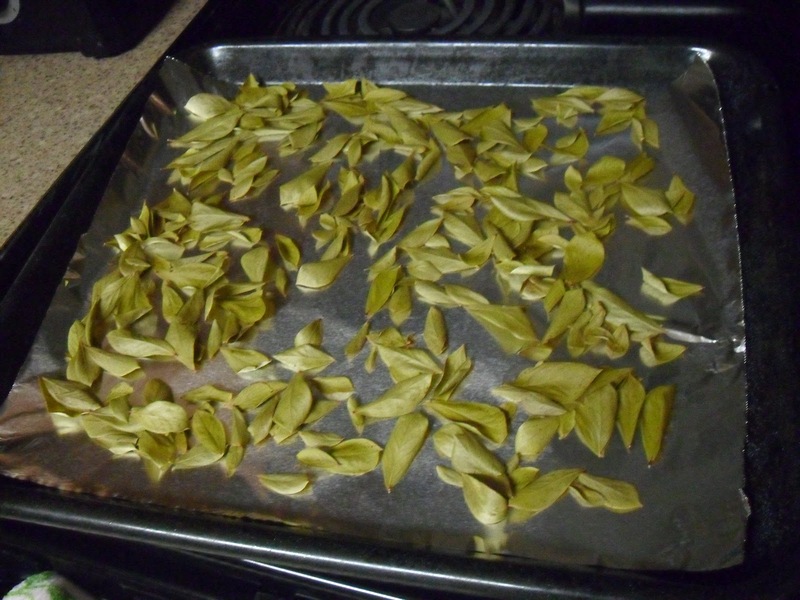 Then, move onto leaves that are a little bit bigger to fill your bowl. 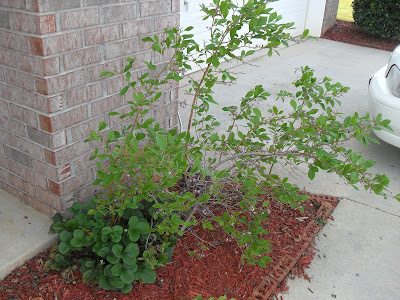 Trust me, once you start picking the bigger leaves, you will not go back to picking smaller ones. 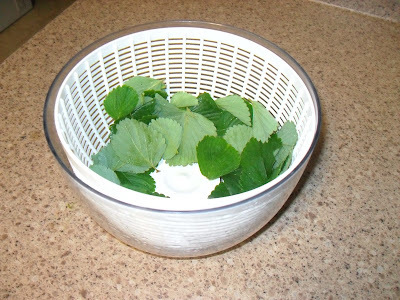 After 234534503 millennia of picking leaves (or approximately 35 minutes) I ended up with this modest bowl of leaves. 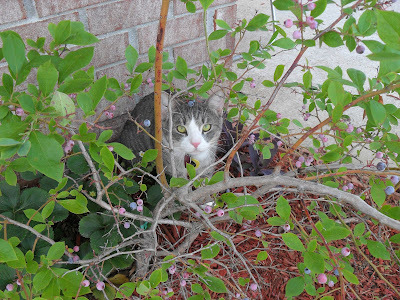 Enlisting the aid of a furry friend is not recommended. They tend to be quite unhelpful. Rinse off your strawberry leaves and dry them. I used a salad spinner. 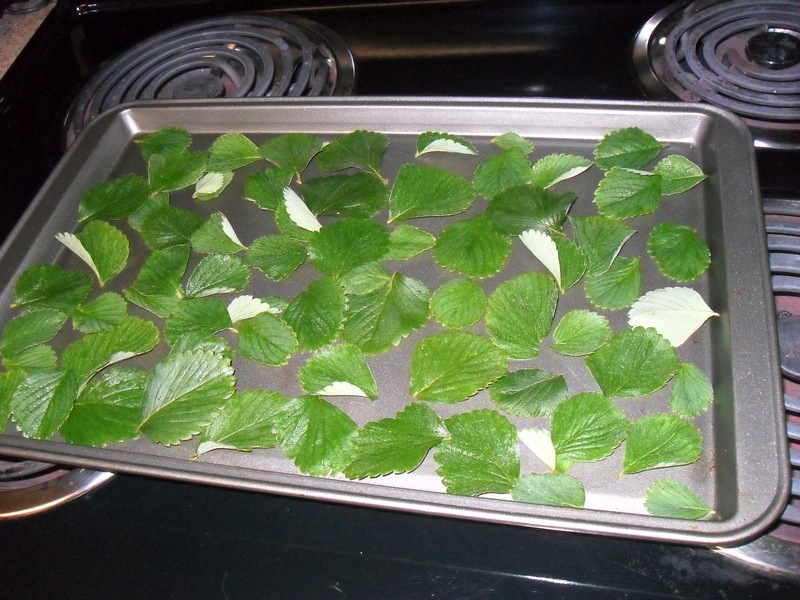 Spread your strawberry leaves evenly on a cookie sheet. 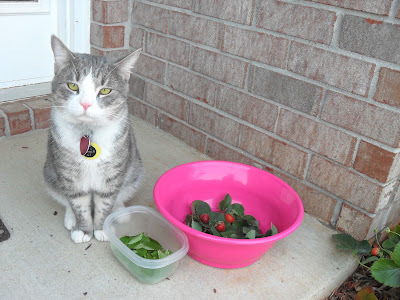 Do the same for your blueberry leaves. Bake your leaves on the lowest possible setting until they dry up. You'll know they're dry when they're crunchy. 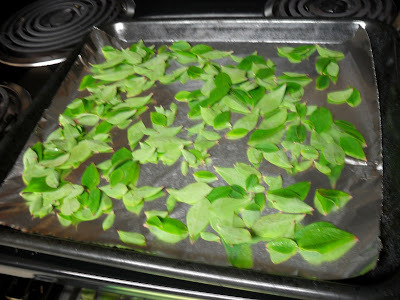 The strawberry leaves took 15 minutes to dry at 170 degrees. The blueberry leaves took 40 minutes to dry because they were on the top rack. They shrink less than the strawberry leaves and become a pretty olive color. Now all that's left to do is store the loose leaves into jars. The tea you've just made will be very mild in flavor. 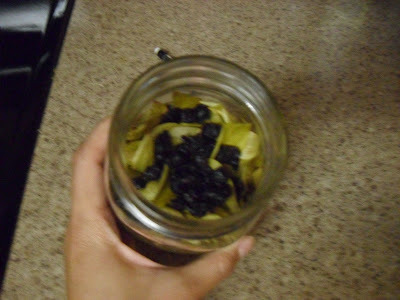 In order to boost the flavor of the tea you can add dried fruit to the leaves. 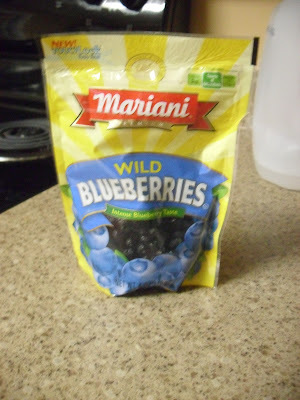 Dried strawberry is craaazy expensive, but I lucked out on finding some dried blueberries at a local grocery store. I put a small handful of blueberries in with my blueberry leaves and shook the jar. 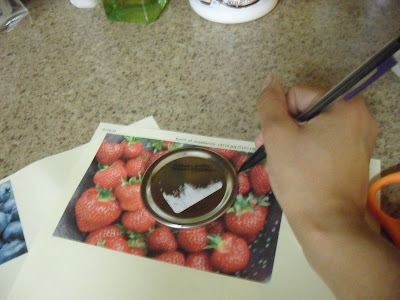 If you want to make fancy shmancy jar lids, print out pictures of your fruit, trace the jar lids, cut them out and glue the photos to the lids. You're done! Enjoy your free, organic loose leaf tea! Disclaimer: This information is not intended to treat, diagnose, or prescribe in any way, and is for informational purposes only. I do not take responsibility for your experience in using it. I trust that you will consult a licensed healthcare professional when appropriate, especially for pregnant/nursing women, anyone over 60 years of age, anyone under the age of 12, and anyone with a serious medical condition. Spring is here. Which means spring break. Which means beaches. Which means sand castles!! 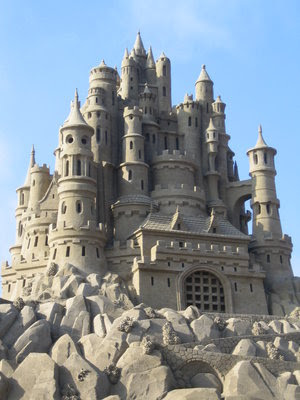 When I was a kid I loved making castles in the sandbox and occasionally on the beach. The problem is....they never looked like actual castle. On the other hand, some people, given the chance, can put together on heck of a castle made of sand. Here's what I've found online. How are you at building sandcastles? 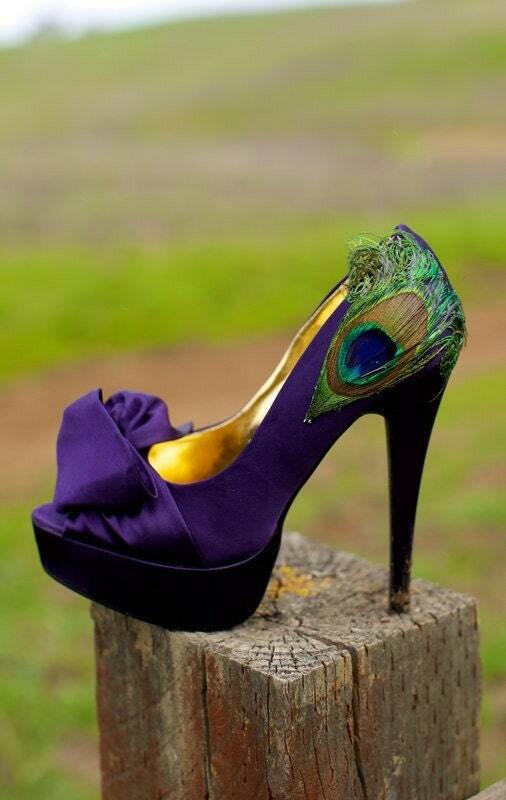 Purple is my favorite color. 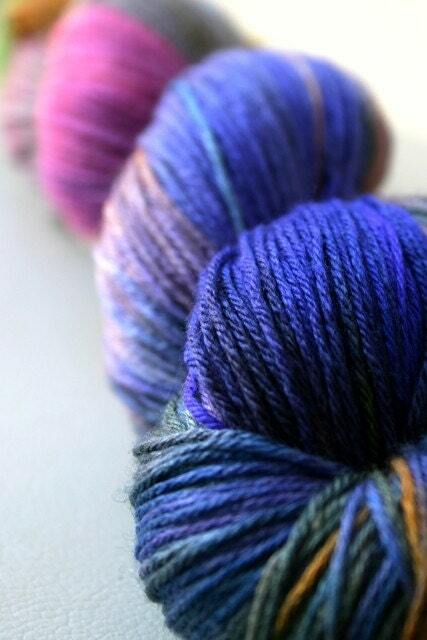 It's the color of royalty and looks beautiful in nearly every shade. 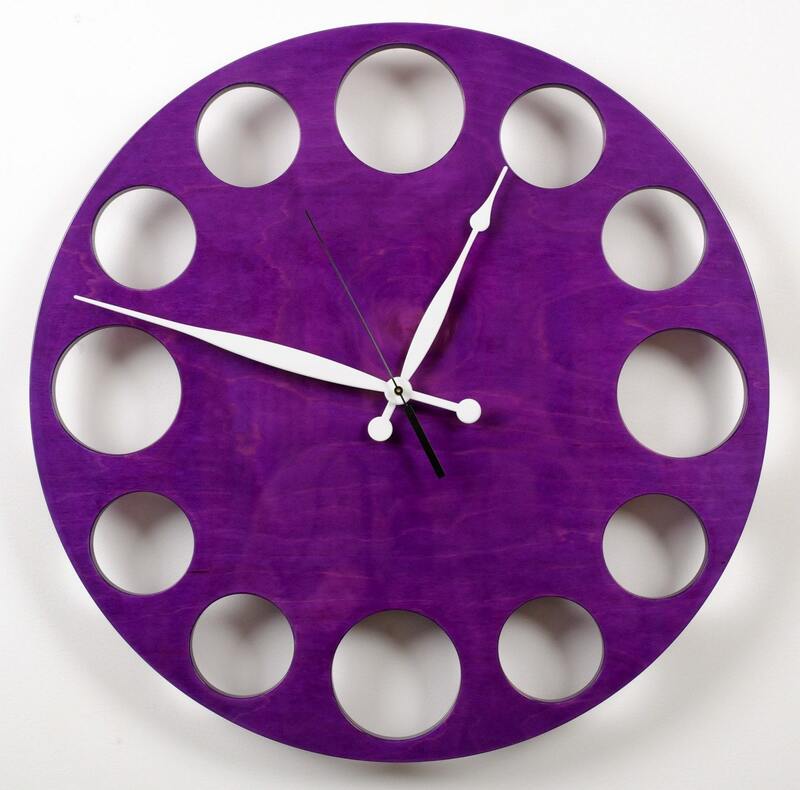 Here are some beautiful purple items that I found on Etsy! 6. Are the historical statements of the Bible accurate? Ancient artifacts unearthed by archaeologists repeatedly confirm the accuracy and truth of the Bible. 3. By about 40 different people (kings, shepherds, scientists, attorneys, an army general, fishermen, priests, and a physician). 4. Over a period of about 1,500 years. 5. On the most controversial subjects. 6. By people who, in most cases, had never met. 7. By authors whose education and background varied greatly. 1. The 66 books maintain harmony with each other. 2. Often new concepts on a subject are expressed, but these concepts do not undermine what other Bible writers say on the same subject. Ask people who have viewed an identical event to each give a report of what happened. They will differ widely and will virtually always contradict each other in some way. Yet the Bible, penned by 40 writers over a 1,500-year period, reads as if written by one great mind. And, indeed, it was: "Holy men of God spake as they were moved by the Holy Ghost." 2 Peter 1:21. The Holy Ghost "moved" them all. He is the real Bible Author. The four Gospels do sometimes differ in the way they report the same event, but they complement each other. Accepting Christ and obeying Scripture changes a drunken, immoral, profane sinner into a loving, sober, pure Christian. Skeptics cannot explain this fact. The Bible says, "Therefore if any man be in Christ, he is a new creature: old things are passed away; behold, all things are become new." 2 Corinthians 5:17. Answer: The changed lives of those who follow Jesus and obey Scripture constitute the most heartwarming proof of Bible inspiration. The drunkard becomes sober; the immoral, pure; the addicted, free; the profane, reverent; the fearful, courageous; and the rude, kind. An American skeptic was visiting an island whose natives were originally cannibals. When he spotted an old man reading the Bible, he ridiculed him for reading a book "full of myths which had already been exposed." The native smiled at him and said, "My friend, be grateful we do believe this book. Otherwise, we would be serving you for dinner." The Bible really does change people, and this amazing fact confirms its inspiration. 9. What evidence for Bible inspiration emerges when we compare Old Testament prophecies of the coming Messiah with New Testament happenings in the life of Jesus? Jesus fullfilled more than 125 Old Testament prophecies concerning the Messiah. "I was working at an after-school event for a committee with the guy that I have a crush on. We were in the teacher’s lounge filling envelopes when suddenly I got a paper cut on my finger. It was no big deal, so I went over to the sink to wash it out. We were joking around, and he came over to me and gave me a surprise hug while I was smiling. So I hugged him back, and when I pulled away, my braces were caught onto his shirt. I was completely embarrassed and he ran away telling the whole committee what just happened." "I was in a rush to get out of class because the bell to go to the next period rang, so I ran up to my teacher’s desk to get a paper signed. When she signed it, I whipped around to leave and knocked over her picture frame AND made her drink fall all over her! To make matters worse, my crush was standing behind me waiting to get his paper signed!" 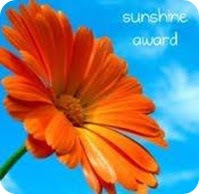 I love doing random acts of kindness, especially the kind that make people feel better about themselves! Operation Beautiful's mission is "to end negative self-talk or 'Fat Talk.'" and to "[help] readers realize how truly toxic negative self-talk is — it hurts you emotionally, spiritually, and physically." To participate in Operation Beautiful, all you have to do is write a positive note such as "You Are Beautiful!" or "You're wonderful, don't change a thing!" Leave these notes anywhere you think women will see them. 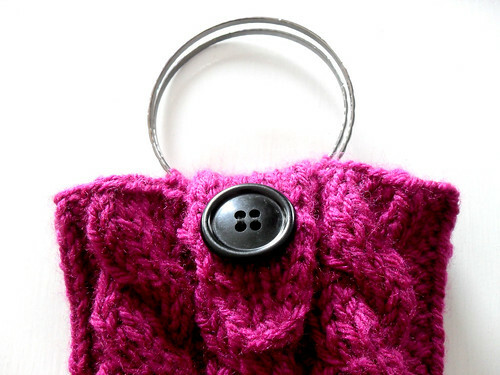 Public restrooms, gyms, grocery stores, and even fashion magazines are great places to start. 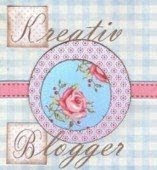 If you email a picture of your note to operationbeautiful@gmail.com they'll put it up on their website!